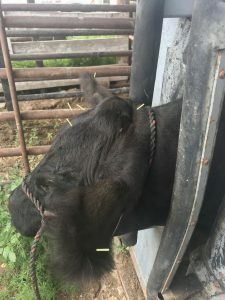 Abstract: “Spencer” is a 14 month old, approximately 1300 lb, Angus feeder steer that is to be shown at the local county fair. “Spencer” fell down in the trailer a week ago and has not travelled correctly since. He appears to be stiff in his left lumber and left gluteal region. This steer was acupunctured once, with improvement noted. History Presentation “Spencer” is a 14 month old Angus feeder steer (#1300) that is to be shown at the local county fair. “Spencer” fell down in the trailer a week ago and has not travelled right since. “Spencer” was born and raised on the owners ranch and has had an unremarkable previous medical history. This animal lives in a small indoor pen, and spends a considerable amount of time tied to the fence, as well as in a cooler to promote hair growth. This animal has had no previous medication. His owner says the animal ‘doesn’t travel as free as he did before falling down”. The animal was bright, alert, and responsive upon gross examination. “Spencer” is halter broke and will easily lead as a horse would. This animal is very stoic and does not get excitable easily. No ancillary therapies had been tried due to slaughter withdrawal issues and the proximity to show time. Physical Exam and Assessments This animal was observed at a walk while the owner led it in the pen. He appeared slightly stiff in his back region and did not fully flex and extend his hips, with the left appearing more affected than the right. “Spencer” was led into the chute by his owner with a halter. He was bright, alert, responsive, yet calm. Temperature, pulse and respirations were normal. His gait was slightly off at a walk upon entering the chute. We did not observe him at any other gait. My myofascial exam showed extreme tenderness and moderate swelling in his left lumbar region and left hip region. I did not palpate his extremities due to safety issues while confined in the chute. 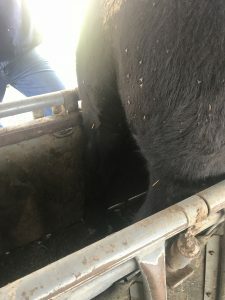 Differential Diagnosis Differentials for acute, mild lameness in a confined feeder steer would have to include footrot, buller injury (trauma), joint infection (haemophilus), kidney infection, soft tissue injury, pelvic injury, waterbelly, and spinal cord/disc injury. Definitive Diagnosis Based on the history, owner observations, and myofascial exam, trauma to the left lumbar and left hip region would have to be my primary diagnosis. It appears there is moderate soft tissue injury in the region of the longissimus muscles, as well as the gluteal muscles. No radiographs were taken of leg. Medical Decision Making Point selection was made based on availability with animal in a squeeze chute and safety. GV 20, Da Feng Men, and Er Jian were chosen to provide some anti-anxiety properties. GV 20 and Da Feng Men act upon the trigeminal nerve, which provides autonomic modulation through crosstalk with the vagal nerve. BL 21, BL 22, BL 23 were chosen because the lumbar area affected is most likely innervated by T4, L1, and L2 spinal nerves. This correlates with the area of lack of mobility and tightness. The ‘hip triad’, GB 29, GB 30, BL 54 was chosen because of possible cranial gluteal and sciatic nerve involvement. BL 40 was chosen, as it is the master point for the lower back, and involves the tibial nerve. Improving the function of the flexors of the foot was the goal with this point selection. Bai Hui was chosen to affect the middle and caudal lumbar nerves. Acupuncture Treatments Points chosen were Da Feng Men, Bai Hui, Er Jian, GV 20, BL 40, BL 21, BL 22, BL 23, BL 54, GB 29, GB 30. All points were dry needled. Head and ear points were done with coated Seirin 0.18 x 30mm needles. The remainder of points were done with coated Seirin 0.30 x 30 mm. Only one treatment was done due to timing between injury and showing animal at fair. Outcomes, Discussions, and References After one treatment, the owner felt that the animal ‘moved out better’ in his hind end. We were able to significantly decrease the visible swelling and myofascial pain in his left lumbar region. The epaxial muscles, specifically the longissimus muscle appeared to be less spasmodic than prior to treatment. The animal appeared to ‘move out’ better after treatment. The cranial stride of his back legs appeared to be lengthened and improved after treatment. I feel the animal appeared visibly more comfortable and slightly less agitated. The animal was very relaxed in the chute with no struggling noted. No adverse events were noted.